Yesterday my daughter Emily came home for Christmas, happily avoiding the many snowstorm-related flight delays that plagued many people over the last few days. 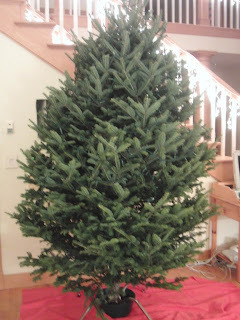 That afternoon, we were able to continue our tradition of going out to buy a Christmas tree together. ... into the mighty "Fugitree"! 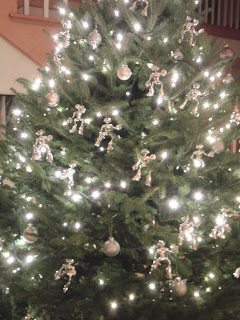 As the idea of decorating the tree with vacuum-metalized Fugitoid figures was originally Em's idea, it seemed only appropriate that she should be involved in helping to hang the fifty shiny 'droids on the tree. 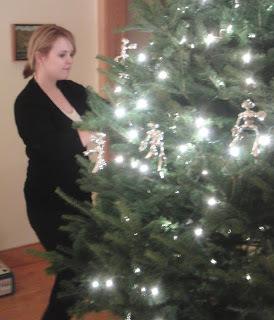 Here she is -- slightly blurry -- hanging 'Toids on the tree. 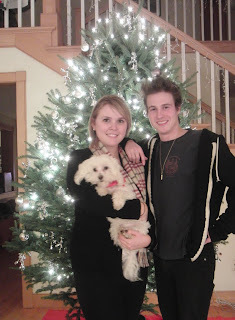 ... and Em, Zach and Louis posing with the Fugitree. 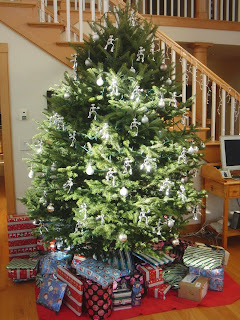 And finally, here's a shot of the tree as it looked in the light of day when I got up this morning. A couple of days ago I decided it was time to start preparing for the creation of the "Fugitree" (as one of this blog's Commenters wittily named it). So I hauled in the huge box of "Fugitoid Collector Figures" from Playmates that I've had sitting out in the garage, and started the process. 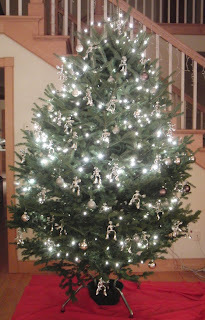 It's drudge work, involving opening each small white cardboard box, carefully slicing open the little plastic bag, removing the Fugitoid, and affixing a loop of ornament-hanging wire around his neck. I'm not sure how may of these I'm going to do -- the big box holds one hundred Fugitoids, but I think the tree will look great with just half that number, maybe less. We'll see. 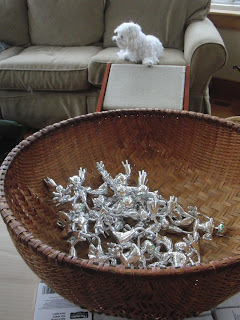 I've already done about twenty of the figures, and here's a photo of them in a large bowl I've borrowed from my wife. ... and a close-up of the photo of Dale (at speed on his Kawasaki race bike) which they used on both packages. 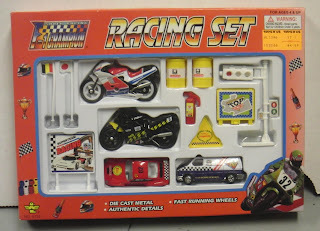 We never had any contact with the company which did this, and I have often wondered how they chose Dale, out of all the possible motorcycle racers around at the time, to decorate their packaging. 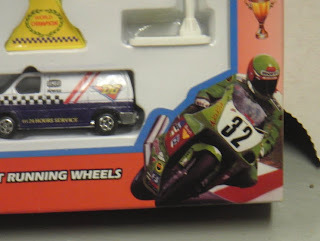 Although it isn't terribly easy to see in this photo, Dale's bike DOES have the Team Mirage logo on its bodywork, as well as the abstract TMNT face design, and during those days of Team Mirage we made no secret of the TMNT connection. 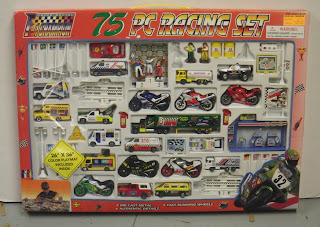 I wonder if the people behind this packaging saw that and thought they might get some mileage for their toys out of that connection. I posted once before (http://plairdblog.blogspot.com/2008/12/merry-christmas-eve-day.html) about a personal Christmas card I made which incorporated an Advent calendar. 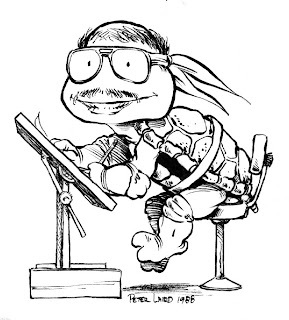 I found another one -- it's undated, but judging from the style of drawing (especially the "old-school" Turtles), I would guess it was from December of 1984.